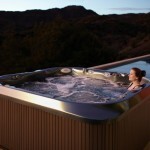 Browse through the Jacuzzi hot tubs page and once you have seen the full ranges on the website, why not visit the hot tub showroom where we have a number of Jacuzzi hot tubs on display? Bring your swimming gear to actually hop in and try one of our Jacuzzi hot tubs. We have a purpose built changing area and a number of tubs that you can choose from. You can see the Jacuzzi® difference a mile away. But get in and feel it, you’ll be amazed at how wonderful you’ll feel afterwards. Go on, let go and enjoy the benefits of a true Jacuzzi® hot tub hydromassage. The J-LX delivers a wonderful massage tailored to your needs; divert the jets to your liking, control the pressure, the power is at your fingertips.